Update: These builds are well under budget this month! The October 2017 PC Builds are very similar to last months and will be more of a quick change in a few minor areas. This is because we are about to see the release of some brand spanking new Intel 8th Generation Coffee Lake processors are set to launch on October 5th. What this exactly means for the monthly gaming pc builds is still unknown, but I would suspect cpus like the Intel i7 8700K or the i5 8600K could very likely make there way into these builds. So do stay tuned if you are waiting to build over the next couple of months or so for some Coffee Lake gaming pc builds. The following builds are still very relevant as we are using a couple of Ryzen CPUS which are meant to compete with the new Intel cpus coming out. Prices may go a little hay wire for a while, so what this means is that these builds are going to be more affordable, so now really is the time to get those awesome sales. The gaming pc builds in this article come in three budgets — $600, $1000 or $1500. Now what this means is that the base builds are priced at those costs, but there are upgrades in and in between for those with slightly different budgets. 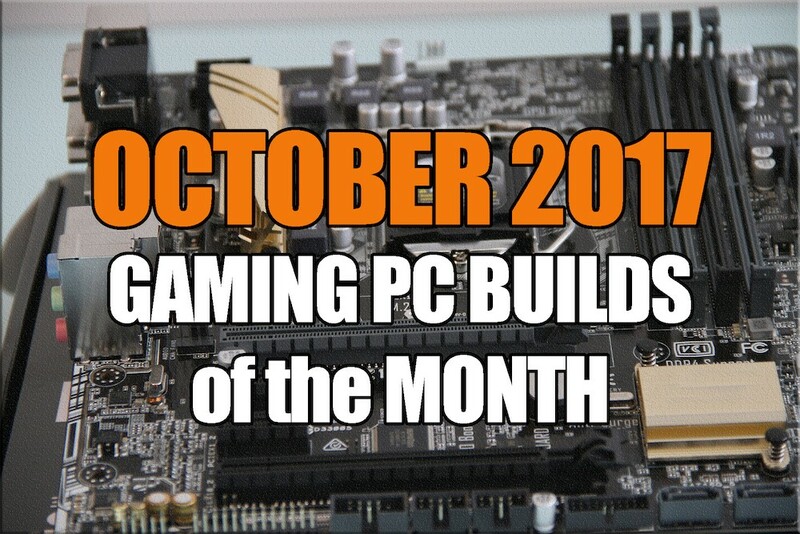 If you are looking for the very best gaming pc builds for October 2017 then you have come to the right place. Therse builds are updated monthly to being you the most up to date hardware possible at the best possible cost per gaming performance. The highest end gaming pc in the monthly gaming pc builds of the month had only recently included an i7 CPU, and now it’s even more affordable. Nothing says you have a high-end rig than going with an Intel i7 cpu and the $1500 gaming pc build includes an Intel i7 7700K processor. Now upon the new Intel Coffee Lake cpu releases being done over the next month or so, we will see how this affects this build, but I do believe the new i7 8700K will take some time before it can fit into the $1500 build for good. The high-end graphics card included is the GTX 1080 (the ASUS GTX 1080 TURBO). This graphics card is made to max out games at 1400p resolutions. As a plus the GTX 1080 has also proven to be very playable on VR platforms (like the Oculus Rift and HTC Vive) should you be interested. If you are looking to beef up this build further, you could also consider the GTX 1080 Ti (included in the hardware upgrades table below). RAM prices have been going crazy for the past while, and are a tad more expensive than they should be. My suggestion is to search for a cheap 16Gb kit of 2X 8GB sticks that you find at the lowest cost. The included RAM/memory, we have 16GB (two 8GB sticks) of Kingston HyperX Fury 16GB Kit, which is a good healthy amount of memory for this high performing $1500 gaming pc build. The hardware upgrades you see here are recommendations for the above October 2017 high-end $1500 gaming PC build. You can choose one or all of the hardware and it will be compatible with the above build and improve it’s performance in some way. For those who are concerned about or want a highly efficient power supply, you could go with the Platinum rated EVGA SuperNOVA 750 P2 — just a smidge more than the G2 EVGA psu included in the main pc build. The above pc build does include an SSD, which is perfectly suited for most gamers and pc builders, but if someone were searching for the fastest and one of the most efficient methods of storage, you could consider a premium PCIe Solid State Drive, such as the Plextor 512Gb M.2 PCIe SSD below. If you want more than the included air cpu cooler included in the main build, then below is the Corsair Hydro Series H100i V2 liquid cpu cooler. 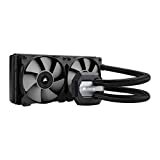 This cooler would be a substitute for the above included Hyper 212 EVO air cpu cooler and would provide a quieter, more efficient / more customized cooling experience. This option would be best purchased now rather then later so as to save on buying only one cooler for your PC. The final upgrade you see below is an EVGA GeForce GTX 1080 Ti, which is a newly release card that now replaces the previous Titan X graphics card. The GTX 1080 Ti performs very similarly to the Titan X, but at a fraction of the cost. Another option here could also be the GTX 1080 graphics card, which will definitely provide more performance for a little less than the GTX 1080 Ti seen below. What can the October 2017 $1000 gaming pc build do? The $1000 gaming pc build is for those who want to game at 1080p into 2K resolutions for under $1000. This PC build that will probably cover most of any average gamers needs. Who is an average game you might say —these are pc gamers who want an affordable pc that they get to custom build to play the most modern games at the highest settings on the most used HD resolutions (1080 to 2K resolutions). Very slight change this month in the CPU category. We have change the Ryzen CPU to an AMD Ryzen 1600 cpu from last months Ryzen 1600X. This is because you can overclock the 1600 to 1600x levels, and the 1600 comes with its own cpu cooler. And when individuals were going to purchase a decent cpu cooler for the 1600X, they most likely have to purchase a compatible bracket to make the cooler usable (which in my opinion isn’t the most new pc builder friendly). The graphics card is the GTX 1060 6GB (ASUS GTX 1060 DUAL 6GB). This card allows you to play on high settings at 1080p and can even play into 1400p resolutions if you wanted to and has recently gone back down in price, making this a great purchase right now. If you have a little more to spend on your card (given the budget for this build is much lower this October), then check out the builds hardware alternatives below where we include a GTX 1070. The RAM included is the affordable kit of Kingston HyperX Fury 8Gb kit, which is enough memory for most gaming pc builds, and you always have the option to upgrade more in the future if need be with the extra couple of slots on the included motherboard. RAM prices are all over the place these days, so do try to look for the best deal for an 8GB kit of 2X 4Gb sticks of ram and you will be fine. The included power supply unit used in this months $1000 pc build is the EVGA SuperNOVA G2 650W power supply, which is a great PSU with all modular cables and it provides the perfect amount of power for this build along with room for some upgrades. Now for the PC case for the $1000 gaming pc build is the MasterBox 5 by Corsair. This case has a very straightforward design, which makes it super easy to build your pc build with. Read the full specifications for the MasterBox 5 over at corsair.com or checkl out the legitreviews.com review of the MaterBox 5 where they have given it a “Legit Reviews Recommended Award. Below are the upgrade ideas for the October 2017 $1000 gaming PC build, these are recommended in case you have a larger budget or want some upgrade suggestions later on. The October 2017 $600 gaming PC build is able to game smoothly at HD / 1080p resolutions in most games on high settings. Most general gamers will most likely be gaming on a 1080p monitor and this will actually be all they need to play the games they want to play. The cpu included in this build is the newer Ryzen 3 1300X cpu. We also don’t need a separately included cooler, as this cpu has one included right in the box. If you want an alternative better cpu, you can check out the Ryzen 5 1400 in the hardware alternatives tables for not much more. For the graphics card we have a GTX 1050 Ti graphics card. This is a very affordable gpu that provides you will good 1080p game play. If you need to further boost your graphics performance, check out the alternatives tables below where we include a GTX 1060 3Gb card, where you will spend approximately $50 more and it is a worthy upgrade. The RAM included is a kit of Kingston HyperX Fury 8Gb kit (like the $1000 pc build) which is enough memory for most gaming pc builds, and you always have the option to upgrade more in the future if need be with the extra couple of slots on the included motherboard. The PC case included is an affordable Zalman Z11 Neo, which provides great cooling performance and overall value at a great price. For a full list of case specifications, please visit Zalman.com. Here you will find upgrade suggestions should you have more to spend or want ideas for hardware upgrade when you have the need in the future for the October 2017 $600 gaming PC build. If you are wanting a different style to your pc enclosure or want a higher quality pc case, you could consider going with a Phanteks Enthoo PRO M. This is just an example of a different case that you could choose from, as there are hundreds to choose from out these to suite your style — although this case is a very well rated case! One of the more important performance upgrade solutions could be to the GTX 1060 graphics card, for a little bit more than the included GTX 1050 ti already included in the above build, so if you can squeeze approximately $50 more into your build, this is worth the consideration. If you wanted a further boost, you can look at the $1000 build where we include the 6GB version of the GTX 1060. For a further bump in performance, you could consider getting a slightly higher-performing CPU such as the AMD Ryzen 5 1400 (this cpu also comes with its own cpu cooler, so all you have to do is swap this cpu from the included Ryzen 3 1300X). 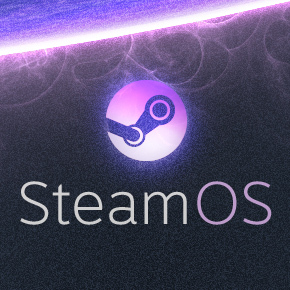 If you don’t already have an operating system laying around for your new gaming pc build, then you’re going to have to either invest in purchasing a standard OS such as Windows 10. Furthermore, there are some free alternatives that you could consider as well and for free. Keep in mind that it is recommended to purchase Windows online or as a USB stick and install it that way as optical drives are not included in any of these builds and nor would you generally need one for any modern gaming pc. Thanks for visiting us for the best October 2017 gaming pc builds of the month over here at Newb Computer Build. These gaming pc builds are updated every month to give you the most up to date builds in these respective budgets ($600, $1000, $1500 & everything in between) giving you a range of the best gaming pc builds to choose from. If you have any questions or comments feel free to leave them below and best of lucking building your best gaming PC this October 2017.